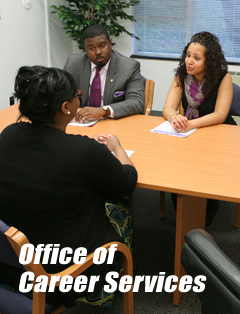 The Office of Career Services is dedicated to providing students and graduates with the foundation necessary for successful career development and advancement. Our mission is achieved through workshops and seminars, career counseling, recruitment programs, resources, and networking opportunities. Our aim is to help prepare our students in their pursuit of legal careers and in their roles as future leaders in America and the global community in a wide variety of settings, including private law firms, public interest organizations, corporations, businesses, government agencies, judicial clerkships, and non-traditional careers.